Drew Walking Tall is going great. In a matter of about 2 months, we’ve raised over $6,000. And, that’s before any big event. So far, it’s been candy grams, t-shirts (speaking of which, I still have white short-sleeve shirts available) and just plain ol’ donations. 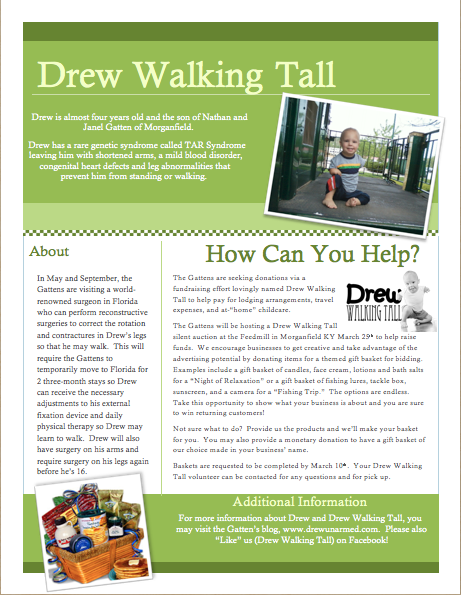 We are starting to heavily plan for the Drew Walking Tall auction to be held on March 25th, 2012 at the Feed Mill. We are having weekly meetings to get organized and have started visiting local businesses looking for themed gift baskets. Each volunteer has an awesome looking flyer if I do say myself to help document details about Drew and our fundraiser. Each of the volunteers have their own list of businesses to visit – some by choice and some, not so much! I have started trying to plan out the logistics of our move including lodging arrangements. I was disappointed to find out that the Residence Inn at the Marriott’s medical rate was FAR too high to consider so I have since moved on to hoping I can find an apartment without paying a lease. And, then there’s the question of do we keep the apartment the whole 6-7 months (from duration of first move down to the end of the 2nd trip) so we don’t have to move items back and forth across the US (which means we’ll be paying for a living space that isn’t being used)? Ugh! So many decisions! I’m trying to move my internet and cable to wherever it is that I live in Florida. Though I am a child of the 80’s who enjoyed life without cell phones, internet, DVD players and lived on the Nintendo (and not the Super! ), I have become such a slave to the millennium that I can no longer live without these essentials. Besides, I need internet to continue working and earning a paycheck so look at it as a way for me to do what I can to support myself. And, besides that, you are going to want to know how things are going with Drew, right? Well, Facebook and the blog require internet! So, it’s a win-win! I wasn’t counting on Nathan being down in Florida for most of the time as the flights back and forth three times during each 3-month stay would be costly. While it is important that Daddy be with us, I was afraid that donators would think it’s frivolous spending. However, at my mother-in-law’s urging I have started to inquire to airlines to try to gain some discounted travel vouchers for Nathan. It would be nice not to have to rely on Skype! And, his presence there will be important for both Drew and me. Please keep checking for updates and keep donating! Don’t forget, we are going to donate a portion back to the Chastity Gibson fund. And, I’m going to reserve an amount of money in honor of a fellow donator that reached out to me via my blog. Knowing that there will be a family in need in the near future, I am excited to have the opportunity to “pay it forward.” Thanks Union County!